High cholesterol does not usually cause any uncomfortable symptoms, so it may be tempting to ignore. However, high cholesterol levels in the blood are strongly associated with a high risk of heart attack, stroke, blocked blood vessels in the legs and kidneys, and may even contribute to dementia. Fortunately, diet, exercise, and medications help lower cholesterol levels and reduce your risk of other serious health problems. Large studies have shown that people with high cholesterol have a much higher risk of developing heart disease than people with normal cholesterol levels. For example, a cholesterol level of 250 doubles the chances of developing coronary heart disease, whereas a level of 300 increases the risk by five. Furthermore, people with high cholesterol—with or without coronary heart disease—are up to 4.5 times more likely to die from heart disease than those who have a cholesterol level below 200. Cholesterol is a sticky, waxy substance that circulates in the blood, and it is basically comprised of two different types of cholesterol. The "bad cholesterol," or LDL, raises the risk of heart disease. The LDL is what is referred to when the aim is to lower cholesterol. The "good cholesterol," or HDL, is the type that actually helps protect against heart disease. High levels of the HDL are beneficial. LDL, on the other hand, tends to stick to the walls of blood vessels to form plaques that hinder normal blood flow. Researchers have discovered that cholesterol chemistry is more complex than was appreciated just a few years ago. For instance, LDL cholesterol can reside in particles of different sizes: small, dense LDL particles, and large, fluffy LDL particles. The small LDL particles appear to increase a person's cardiac risk more than the large particles. Similarly, small and large particles of HDL cholesterol have also been identified, and the two sizes also affect cardiovascular risk differently. 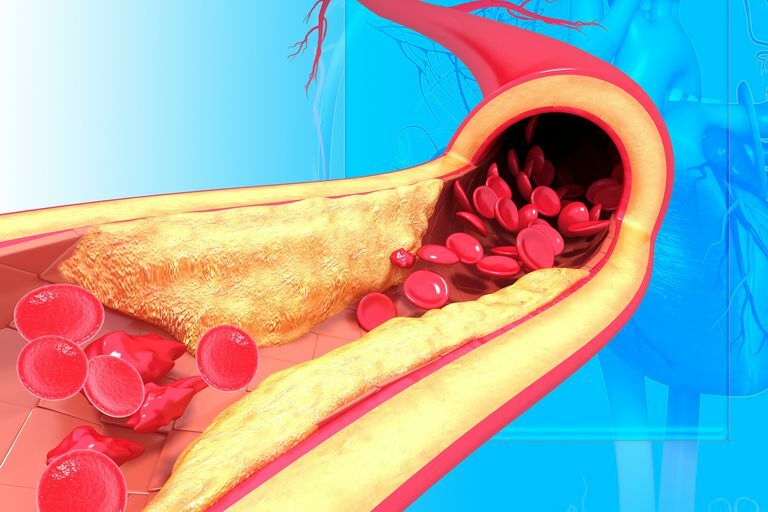 At this time, experts do not recommend measuring LDL and HDL particle size on a routine basis because collecting this information usually does not affect treatment options. Such measurements will become more routine as scientists learn more about cholesterol particle size, and in particular, learn ways to change cholesterol particle size to improve a person's outcomes. What Is Small, Dense LDL? Plaques can suddenly rupture, producing localized blood clotting and acute blockage of an artery. This sudden blockage often causes a heart attack or a stroke. Many people use cholesterol-lowering medications such as statins, which can dramatically reduce the possibility of heart disease. Lipitor (atorvastatin), Zocor (simvastatin) and Crestor (rosuvastatin) are examples of commonly prescribed statins. While there are several kinds of drugs that can reduce cholesterol levels, statins are the only family of cholesterol-lowering drugs that have been shown in many clinical trials to improve outcomes in people at high risk for cardiovascular events. Statins have several properties that might reduce or stabilize plaques—it is not at all clear that the cholesterol-lowering of statins provides their chief benefit. This is why current guidelines recommend instituting statin therapy based on a person's overall cardiovascular risk, and generally not on their cholesterol levels. Since cholesterol guidelines rely so heavily on statins, these drugs are recommended for many more people than they were just a few years ago—this fact has created much controversy. You can learn more about potential over-treatment issues. Just as plaques may block blood flow in the coronary arteries causing a heart attack, the substance may also stick in the carotid arteries that run between the heart and the brain. When a piece of plaque dislodges from a carotid artery, it can travel to the brain causing a "brain attack" or stroke. Although many cholesterol-lowering medications reduce the risk of heart disease, statins can also prevent strokes. There is mounting evidence to suggest that high cholesterol and a diet high in fat and saturated fat may also contribute to dementia, including dementia caused by Alzheimer's disease. Autopsies of patients who had Alzheimer's disease, who also suffered from dementia, showed significantly more blocked arteries in the brain that were similar to blocked arteries in the heart known to be caused by high cholesterol. However, some studies suggest that taking statins may help prevent dementia and possibly slow the progression of dementia related to Alzheimer's disease. The best way to keep cholesterol levels in check is by sticking to a low-fat diet. In particular, it is important to avoid saturated fat, which are fats from animal sources such as butter or lard, because saturated fats are the main contributor to higher total cholesterol and to high levels of the "bad cholesterol" or LDL. With heart-healthy diet changes, it may be possible to reduce cholesterol levels to a normal range, which may result in patients being able to talk to their healthcare providers about cutting back on their cholesterol medications. Avoid fried foods. Instead, choose items that have been baked, grilled, broiled or steamed. Choose lower-fat meats, such as fish, poultry (with the skin removed) or lean cuts of red meats. Use spices for flavoring, instead of butter or oils. The best way to improve HDL is through​ ​aerobic exercise such as walking, jogging, cycling, swimming, aerobics or hiking. If fitness is new to your lifestyle, you may need to try several different exercises before finding a plan that works for you. Some people like to exercise at home, whereas others prefer a gym. Some people exercise in the morning and some prefer to exercise later in the evening. If your healthcare provider chooses to prescribe cholesterol-lowering drugs, be sure to provide all information about any other medications that you may be taking. Also be sure to take medications as directed. Sometimes these drugs may cause uncomfortable side effects, such as nausea, abdominal pain, or muscle cramps. Mention any side effects you are experiencing to your healthcare provider right away. In most cases, you can take steps to relieve the symptoms or switch to a different medication. The "cholesterol hypothesis," simply put, is the conjecture that increased LDL cholesterol levels increase the risk of atherosclerosis. In recent years, this has been called into question. Currently, however, expert panels accept the hypothesis. While this may change in years to come (and with further research), you can learn more about the controversy on the cholesterol hypothesis. Bernick, C., et al. "Statins and Cognitive Function in the Elderly." Neurology 65(2005):1388-94. Furie, Karen L., Janet L. Wilterdink, and J. Philip Kistler. "Secondary Prevention of Stroke: Risk Factor Reduction" UpToDate.com. 2008. UpToDate. Maase, I., R. Bordet, D. Deplanque, A. Al Khedr, F. Richard, C. Libersa, and F. Pasquier. "Lipid Lowering Agents Are Associated with a Slower Cognitive Decline in Alzheimer's Disease." Journal of Neurology, Neurosurgery, and Psychiatry 76(2005): 1624-9. Pekannen, J., S. Linn, G. Heiss, et al. NEJM "Ten-year Mortality from Cardiovascular Disease in Relation to Cholesterol Level Among Men with and without Preexisting Cardiovascular Disease." New England Journal of Medicine 332(1990):1700-7. Press, Daniel, and Michael Alexander. "Prevention of Dementia." UpToDate.com. 2008. UpToDate. Rosenson, Robert S. "Clinical Trials of Cholesterol Lowering for Primary Prevention of Coronary Heart Disease." UpToDate.com. 2008. UpToDate. Rosenson, Robert S. "Clinical Trials of Cholesterol Lowering in Patients with Coronary Heart Disease or Coronary Risk Equivalents." UpToDate.com. 2008. UpToDate. Shadlen, Marie-Florence, and Eric B. Larson. "Risk Factors for Dementia." UpToDate.com. 2008. UpToDate. Stamler J., D. Wentworth, and J.D. Neaton. "Is Relationship Between Serum Cholesterol and Risk of Premature Death from Coronary Heart Disease Continuous and Graded? Findings in 345,222 Primary Screenees of the Multiple Risk Factor Intervention Trial (MRFIT). Journal of the American Medical Association 256(1986):2823-8. Wilson, Peter WF. "Overview of the Risk Factors for Cardiovascular Disease." UpToDate.com. 2008. UpToDate. Wolozin, Benjamin, Wendy Kellman, Paul Ruosseau, Gastone G. Gelesia, and George Siegel. "Decreased Prevalence of Alzheimer Disease Associated With 3-Hydroxy-3-Methylglutaryl Coenzyme A Inhibitors." Archives of Neurology 57(2000):1439-43. Wright, Clinton B. "Etiology, Clinical Manifestations, and Diagnosis of Vascular Dementia." UpToDate.com. 2008. UpToDate. "Your Guide to Lowering Your Cholesterol with TLC." National Cholesterol Education Program (NCEP) and NHLBI Obesity Education Initiative. Dec. 2005. National Heart, Lung, and Blood Institute (NHLBI), National Institutes of Health.